Every so often when it comes time to write my newsletter, I have nothing to say. Let me rephrase that: I have a lot to say, but it is all a jumble and not at all clear how to create a cohesive piece that has meaning. There is so much going on, so many thoughts, that I just don’t know where to go with it all. I’ve been in this phase for a few months now. In fact, I never did get anything out last month. But since school has once again gone into session, I feel compelled to keep up with those great kids and write something even if it is an essay on “What I Did This Summer”!!!!! So, “What I Did This Summer”……. I worked. I gardened. I swam. I entertained. I cooked fresh, healthy, locally sourced meals. I napped….almost every day. I read. I listened to books on Audible. I laughed a lot. I sat and did nothing. I watched the sun go down and the stars come out. I spent endless hours talking with my husband and sharing our thoughts and plans. I searched for the Northern Lights and have yet to see them even though I know they have been around. I met lots of new people. I reconnected with old friends. I spent a lot of time just being. I enjoyed the visits with family and friends. I spent a lot of time out in nature just absorbing its beauty, its power, its unsolvable mysteries. All in all, nothing huge to report other than I feel so refreshed and so filled. There is something about the Great Lakes that fills me in a way that no other place can. It’s a place that I recognize and know in a deep recess of my soul. There are so many places that take my breath away, but the Great Lakes is where I am most in sync with myself. This is something I never would have recognized in myself years ago. I grew up near Lake Erie, spent all of my adult years near Lake Michigan, and most of those years I yearned to live somewhere else, not realizing I was already in my “happy spot”. And once we left the Great Lakes for “Warmer Climes”, which by the way I have really loved too, there was a part of me that still yearned for the smell of the earth here, the feel of the breezes off the big lakes on my cheeks, the sight of the deer drinking from the lakes, or the eerie sound of loons calling to each other. And the hardwoods and the wildflowers here…..all heaven to me. I could write about this all day. I would love to share with you all my thoughts about the Great Lakes and how different they are from one another. 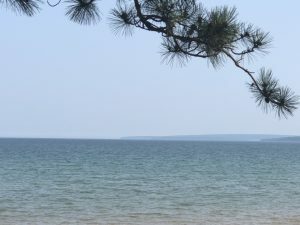 Or the wonder of crossing the Mighty Mac from the lower peninsula of Michigan to the Upper Peninsula and seeing that huge huge huge expanse of water from Lake Michigan, through the Straits of Mackinaw and down into Lake Huron. And no skyscrapers. Just nature and a few signs of dwellings and boats. 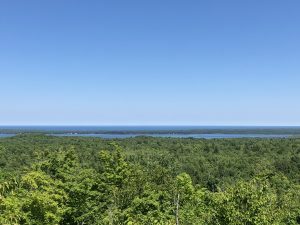 And then after driving another 4 hours or so to see the huge expanse and wildness of Lake Superior which holds 10% of the world’s fresh water. Breathtaking. We met a kayaker this summer who was kayaking all alone from Duluth, MN. (a good 6 hour car drive from here to the West), to Grand Marais, about another 3 hour drive to the east of here. Can you imagine? Kayaking all that distance alone, camping alone at night, only to do it all again the next day? We met him when he stayed across the street at the Inn, a night of luxury, of running hot water, hot meals, much needed conversation, and a day off from the rigorous paddling along the shores. This is a guy who wanted to know this area intimately, and did it. I loved his spirit and his ability to put his love of this area into achievable action. The summer is a good time to do this as Lake Superior’s waters can be quite calm in the summer. But come fall, November especially, the storms are wild and fierce. Most people have heard the poignant melody as Gordon Lightfoot sings the ballad of the Edmund Fitzgerald that went down with all aboard off the shores of the UP on a stormy night in November. On a beautiful, calm summer day you just can’t believe it can be so nasty, but the waves on this big expanse of water can reach 30 feet in a storm. So what did I do this summer? I just took as much of this in as I could. It was like trying to take as deep a breath as I could so that I can keep it with me as long as possible. I love this part of the world and I so hope that you too are in a spot that speaks to your soul as deeply as this place does for me. Our house is very funky, quite small, and rather inconvenient in some ways but none of that matters to me. I am so filled here, so happy here in a very quiet, profound and deep way. From this place, then, I send you Peace. And Wholeness; Contentment, and the Joy of napping whenever you feel like it, or the thrill of a hike or bike ride along the trails whenever you would rather be out in nature. I want each of you to have what I found this summer: a place of my own where I truly belong.